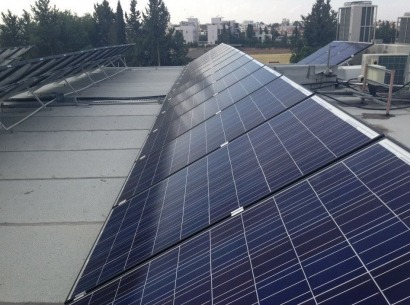 Innotech Solar (ITS) has equipped The Falcon School, located in Cyprus capital of Nicosia, with photovoltaic modules. The installation features a direct coupled system whereby the load consumer, in this case a water filtration system, is directly connected to the PV modules and as such is an off-grid solar installation. According to the Scandinavian-German manufacturer, this system design ensures maximum power yield from the array. In Cyprus, a maximum of €33,000 of funding is provided to cover 40 percent of the total costs of off-grid projects with a commercial use. The PV installation is expected to save the school around €25,000 in energy costs every year. The installation provides enough solar power to filter the private school’s 700-cubic-meter swimming pool. The solar installation meets the filtration system’s entire electricity demand, which up until now has represented a huge expense for the school. While Innotech Solar delivered 80 EcoPlus modules, each with an output of 250 Wp, the solar project was built by EcoEnergia Cyprus, a company pioneering the way in the field of renewable energy in Cyprus. The installation was put into operation at the beginning of this year. “Even with the incentives out of the picture, savings in electricity costs will cover the amount invested into the solar installation within two years," said Vasilis Vasiliou, managing director of EcoEnergia. Emanuele Paese, head of sales & marketing Europe at Innotech Solar, said the project proves that PV is competitive with conventional sources in different countries and market segments. It also "highlights the importance of using reliable, high-quality components in a system,” Paese said.